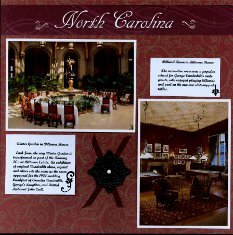 These Biltmore Estate Scrapbook Layouts were done from a collection of photos and post cards from a couple of different visits to the Estate in Asheville, North Carolina. These layouts were made using a new product I discovered at Scrapbook.com called a Swinging Shutter (or Gatefold) Page Protector. I recently ordered a set of 3 of these and loved the idea of using this for some of the garden photos taken for my Biltmore Estate Scrapbook. You can find these for your 12 x 12 pages and 8 & 1/2 x 11 inch pages also. Just click on the banner link below and search for Swinging Shutter or just Page Protectors to see more interesting page and photo protectors to use for your scrapbook layouts. When the Swinging Shutter Gatefold Page Protector is closed this is the layout. This Gatefold concept makes it very easy to show just a few extra photos for the layout. Scrapbook-advice.com Tips: Ever have those double sided papers that you really like both sides? This is a great way to use both sides at the same time. The two flaps will hold background paper that is 12 inches tall and just a shade short of 6 inches wide. 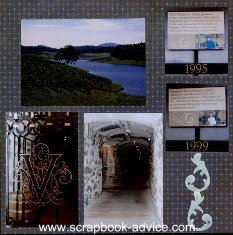 These Biltmore Estate Scrapbook Layouts of the Biltmore Winery also used the Scrapbook.com Swinging Shutter (or Gatefold) Page Protector. The background for the left and right pages was from a sheet of blue plaid background cut into 2 sheets 6" wide by 12" tall. The die cut on the right page in the light blue was cut using the Spellbinders Borderability Grand Illumination which is 12 inches long. This die cut was carried over to the inside pages as well. Also on the right side was a photo of a cart with grapes and leaves that was cropped to show only the cart. 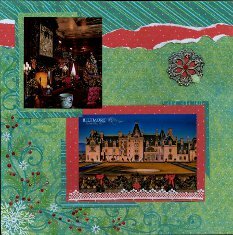 The background in the center was from the Biltmore Scrapbook Kit purchased while at the estate with some photos from the tour. When the Swinging Shutter (or Gatefold) Page Protector is opened, this is the view. The background papers were from the Personal Shopper February 2011 Kit. The Spellbinders die cut from the previous layouts showing the outside of the gatefold, was carried over to the inside, but cut into 2 pieces. 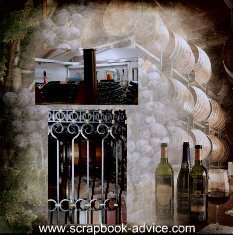 Photos used on both the above sets of layouts include photos of the time line posted at the Winery with details about the history. More layouts in the Biltmore Estate Scrapbook of the Butterfiles using a double sided paper with a taupe color design on one side and the Large Blue Butterfly on the right side. 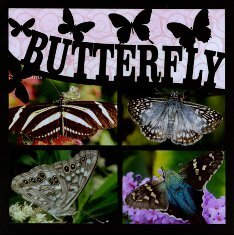 Each of the individual Butterfly photos was matted on a a light blue matte cut from a sheet of Bling by Bazzill. The other five Butterflies are a clear plastic with the butterflies printed on the plastic and they all have a touch of glitter, the one on the right has glitter and silver rhinestones. 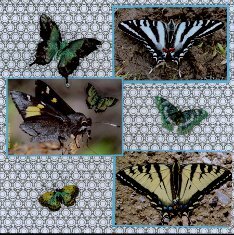 If you can only see 4 smaller butterflies, one is positioned on the center photo on the left hand page. The double sided paper and butterflies were both purchased at the CK Convention in Charlotte, NC in August 2010. 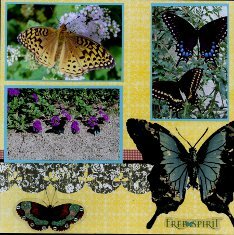 They are called the Big Butterfly(front and back) from the Artsy Urban Collection by Melody Ross and distributed by g.c.d. studios. 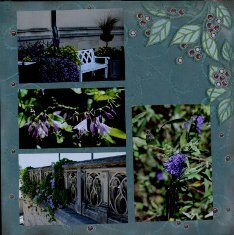 These next two layouts for the Biltmore Estate Scrapbook were inspired also by the Biltmore Walled Garden by the Conservatory. 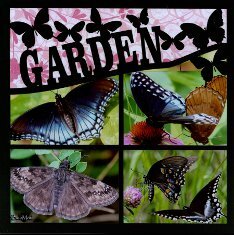 For these Butterfly photos I used a Die Cut Page Kit by Dillon's Laser Designs purchased at the CK Convention in Charlotte NC in August 2010. These neat Die Cut Page Kits make putting together a stunning scrapbook layout very quick and easy. All you have to do is trim your photos down a bit to fit into the openings. Scrapbook-advice.com Tip: If you don't have enough photos use a pretty piece of patterned paper to go with the background paper or you could just use the background paper and put in a journaling block. These next two layouts for the Biltmore Estate Scrapbook were inspired by the lovely road in the Estate and we just had to get some photos of the cute sheep - one in particular standing on top of a hay bale in the center of the little flock. These layouts were done digitally using my Heritage Makers Digital Scrapbooking account. 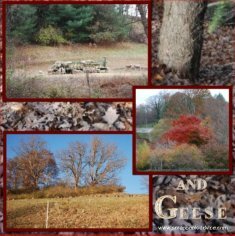 For both layouts, I used for background paper a photo of the leaves collected on the ground and then moved photos of the sheep over on top. 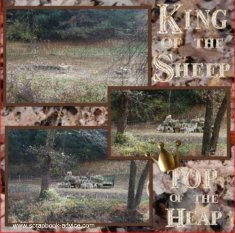 For the left side Text which says, "King of the Sheep, Top of the Heap" I used a font with a line of glitter through it and then pulled in a Golden Crown embellishment to represent the King. Scrapbook-advice.com Tip: I could have printed the layout without the journaling and added it after receiving the printed 12 x 12 layout. This mixes the two formats of traditional and digital scrapbooking, and lets me make use of my Cricut or rubber stamps for Titles. 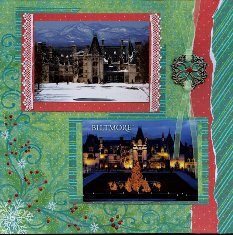 These Biltmore Estate Scrapbook Layouts were done using paper, ribbon, chip board scroll design and Dazzles Embellishments from a Paper Wishes Personal Shopper Monthly Kit from November 2010. For the page on the left, the Ornament Print on the paper matched the Dazzles set that was included in the kit and the Dazzles were laid over the print to accent the ornaments. I colored the paper behind the Dazzles with Copic Metallic Spica Markers and also used the Copics to add the journaling on the upper right page in my own hand writing. The 2 photos on these pages were from a photoshoot during the Christmas Candelight Tour. 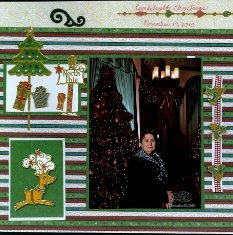 The photos came in a very nice folder frame, but I decided to take them out and incorporate them into some Christmas Layouts. Two more Biltmore Estate Scrapbook Layouts using papers, lace and organza ribbon, and large Brad Buddies from the Paper Wishes Personal Shopper Kit from November 2010. Scrapbook Technique used here is the Torn Paper and also using striped paper on the diagonal for part of the borders. This technique was also provided in the Newsletter that came with the kit. For the Floral and Scroll work design that was in the corners of the background paper, I accented the Red Holly Berries using a Red Pearl Pen by Viva - this pen makes perfectly round pearl dot. These Pearl Pens come in 8 different colors, including Silver and Gold. Photos for these layouts came from Postcards purchased at one of several locations on the Estate. The background papers are a piece of Burgundy Glitter Scroll work paper from Bo Bunny called Snowy Serenade Concerto and plain Ivory from my stash. The two large photos came from the Ambassador newsletter sent to me after purchasing an annual pass to visit the Estate. The three smaller photos on the left came from the photo frame provided from the photoshoot mentioned above. The three smaller photos on the bottom of the left page were stickers purchased at the Stable Cafe Bookstore as were the small Persian Rug Bookmark and the round "V" was part of a set of Scrapbook Embellishments. 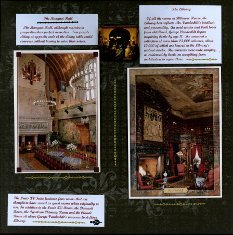 These two Biltmore Estate Scrapbook Layouts used for background paper a Black and Grey Distress Brocade pattern that came in a Best Occasions Mixed Media Pack of black, white and grey. The Embellishments on these pages are very simple and consist only of Gold Border Dazzles and Black Border Dazzles, placed on the background and on the white journaling blocks. All photos on these two layouts were from Postcards purchased on the Estate. All journaling was information from the back of the Post Cards. 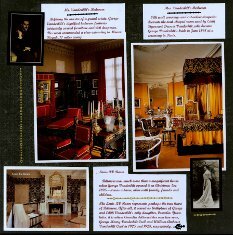 The left page postcards show the bedrooms of the Family Members and there are two small photos of Mr. George Vanderbilt and his wife Edith and inserted on the bedroom photos. 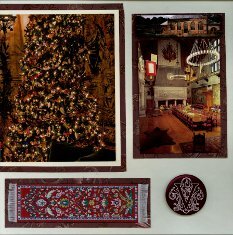 Background paper is from Paper Wishes November 2010 Personal Shopper Kit is a Dark Red with Gold Swirls. Embellishments are two large Medallion Brad Buddies also from the Paper Wishes Kit and Black Organza Ribbon accenting the Brad Buddies. Black Dazzles accent the Journaling Blocks and Silver Dazzles accent the North Carolina Title Journaling Block. All photos and come from purchased Postcards. Journaling is done in Dark Red on Computer in a script font. 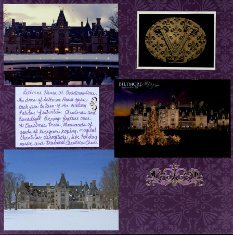 These last layouts from the Biltmore Estate Scrapbook were done using background paper of a Purple Scroll Design paper from the Paper Wishes November 2010 Personal Shopper Kit. 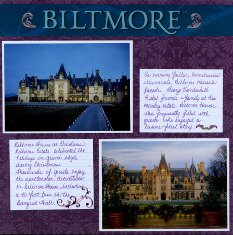 The Journaling Title Biltmore came in the Scrapbook Kit purchased at the Stable Bookstore on the Estate. 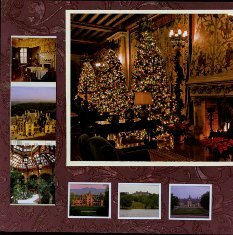 Postcards purchased at the Estate of the house in Winter and Christmas decor provide all the photos. 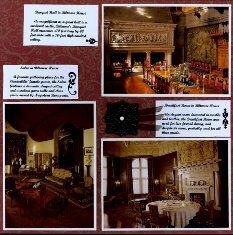 There will be more of the Biltmore Estate Scrapbook Layouts soon. The only photos I took were outside so all the inside photos have been provided from post cards and professional photos taken during my visits. 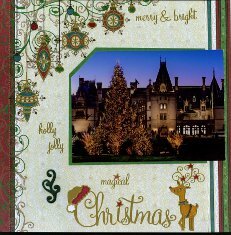 I purchased a lovely Biltmore Scrapbook Kit at the Bookstore in the Stable area and I want to show you more of what was available in the kit soon as the pages and embellishments are just beautiful.